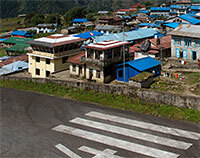 Lukla aiport was renamed Hillary Tensing Airport in 2008. The landing strip is built on the steep incline of a hillside. Its length is 450 m and width 20m and the runway incline is a staggering 12%. The apron has 4 stands and there is one heli-pad located 150m below the air traffic control tower. No landing aids are available and Air Traffic Service is limited to AFIS (Aerodrome Flight Information Service) only. 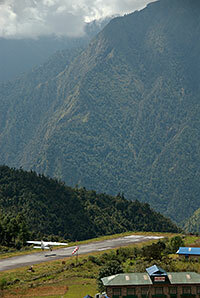 Landing in Lukla leaves no room for error. Pilots throw their propellers into hard reverse before they touch down and gun the engines as they race down the hill for takeoff. Considering the extreme landscape it was the best candidate for the engineers to construct the facility. The strip is at an elevation of 2800 m with a an abrupt drop off down to a river valley below. 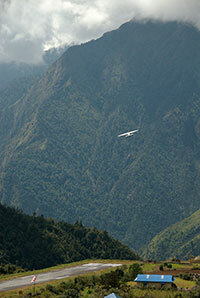 The approach is through a maze of spectacular mountain peaks and the air is often cluttered with clouds. There is a big hill right behind the landing strip. 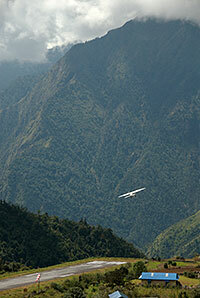 You also need to clear a high ridge, bank left, descend steeply, straighten the airplane and land. Navigation is by sight only and you need to negotiate several layers of clouds which can hang on the high hill or rise from the deep valley. This is why flights will often be cancelled and you could be stuck in Lukla waiting for a plane for days on end. 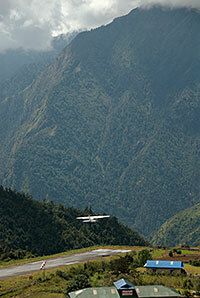 If this is worrying you one comforting thought is that only the most experienced pilots in Nepal are flying to Lukla. The airport is quite popular as Lukla is the place where most people start their trek to the Khumbu and Everest Base Camp and Lukla is Nepal's busiest domestic airport, and in the peak season the airlines operate over 50 flights a day through the facility. 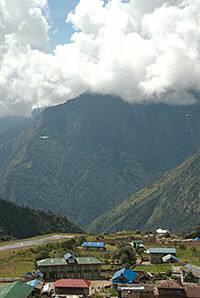 Lukla airport has a bad reputation and is always present in lists of the most dangerous airports in the world. 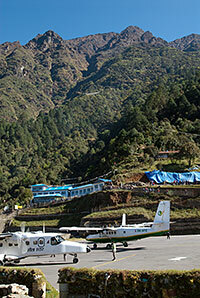 Certainly the first time you land in Lukla you will feel a little nervous but after a while you will get used to it. That's if you care to repaet the experience! Accidents have happened (as recently as in October 2008) but on the whole, considering the amount of traffic it is probably not much more dangerous than driving your car on a busy road. The alternative is to walk about 5 days to/from the roadhead at Jiri. To give you an idea of the traffic there is in Lukla take a look at the sequence on the right: between the second image and the 9th only 90 seconds have elapsed. You can see the two planes in the 6th image. As planes tend to fly only in the morning and can take no more than 18 passengers (only STOL airplanes can land in Lukla) there is a constant stream of them flying back and forth from Kathmandu, 35 minutes flight away in the main trekking seasons. I have seen turnover times as short as 10 minutes from landing to take-off with a new planeload of people. 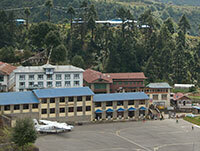 Lukla airport may seem very chaotic but it is a pretty well-oiled machine. The control towers. The one on the right is the old one and not used anymore (except for drying the clothes of the airport personel!). The tower on the left is manned by two or three air traffic controllers who are in constant radio contact with Kathmandu airport and the planes. They will decide if conditions are good enough for planes to leave Kathmandu and land in Lukla. Often the clouds conditions change so quickly that an aircraft that has been cleared to leave Kathmandu has to be turned back when it approaches Lukla 30 minutes later because there is no more visibility. In this image you can see how close to the houses the airport is located. Lukla seen from higher up (on the way to the Zatrwa La). You can just make out the landing strip in the centre of the photo. On the apron with the tall hill at the end of the runway. The plane in the centre of the image is the ill-fated Yeti Airlines 9N-AFE which crashed just short of the runway on the 8th of October 2008 killing 18. This photo was taken a year earlier.